R&C: How would you describe the prevalence of fraud and money laundering, and the extent of the problems it creates, around the world? Caldera: Fraud and money laundering are pervasive and well entrenched in today’s global economy. Both fund some of the most nefarious operations around the world, including terrorism, drug cartels, human trafficking, illicit gun purchases, corruption, failed states and many more. The most powerful criminal organisations use this money to influence law enforcement, policies, elections, governments and the overall world economy. Fraud and money laundering are not going away anytime soon. 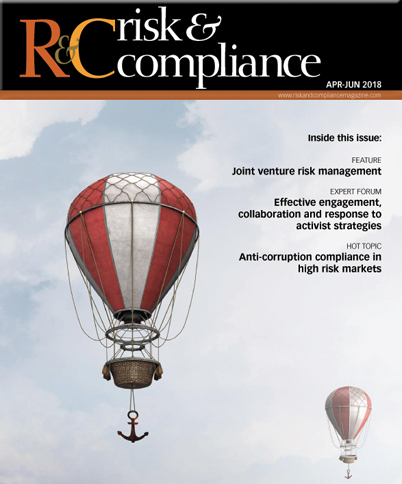 R&C: What general steps are regulators taking to combat fraud and money laundering? How are companies responding to the increasing obligations being demanded of them? Caldera: Regulators are focusing on enforcing regulation and enforcement actions to remedy bad behaviour at financial institutions. There have been large, important regulatory efforts in the past few years in important economies including China, India, the EU, Nigeria, Australia and the US, to name a few. Global enforcement actions have risen in orders of magnitude and the adoption of compliance requirements by countries subscribed to the Financial Action Task Force (FATF) is encouraging. Organisations are spending hundreds of millions of dollars in compliance efforts as regulatory efforts tighten and enforcement actions increase. However, questions about regulation cost effectiveness are top of mind. Technology will have an important impact in operational costs. Anecdotally, more money is spent on reactive efforts rather than proactive efforts.